'Only barbarians can do this kind of thing,' says Samaria official. 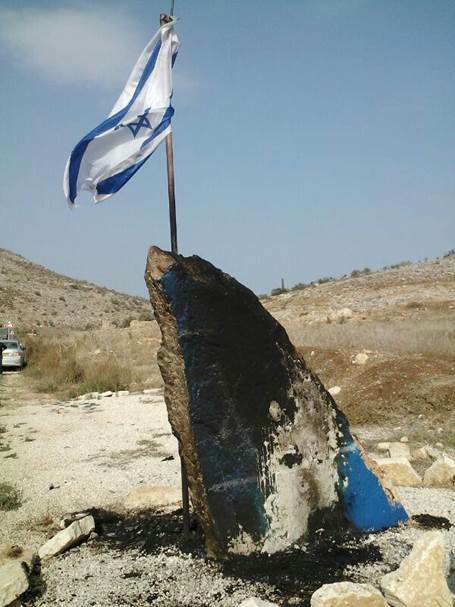 Arab vandals have desecrated the memorial for Rabbi Meir Avshalom Chai, who was murdered by terrorists in December of 2009. The destruction takes place about one month before the fourth anniversary of the murder will be marked. The memorial was also set aflame on the first anniversary of the rabbi's murder. Rabbi Meir Avshalom Chai, 40, of Shavei Shomron, was mortally wounded in the head when terrorists fired at the car he was traveling in, between the Jewish communities of Shavei Shomron and Einav in Samaria. He left behind seven children, of whom the youngest was two months old at the time of the murder, and the oldest was 17. The latest attack comes a day after a peaceful protest vigil in Gush Etzion, south of Jerusalem, was attacked twice in less than two days. The vigil was declared after Arab terrorists hurled a firebomb at the car carrying the Khoury family, injuring husband and wife Zachy and Na’ama. Zachy Khoury described to Arutz Sheva the terrifying moment he saw his wife catch fire after the molotov cocktail struck their car outside the Israeli village of Tekoa.